During the mid eighteenth century, a group of farmers from the northern section of Providence petitioned the general assembly to allow them to become a separate town. They were unhappy with the government of Providence because they felt it did not meet their particular needs as farmers, as it was more concerned with the merchants and businessmen of the time. On June 13, 1765, the general assembly passed the request and the Town of North Providence was created. 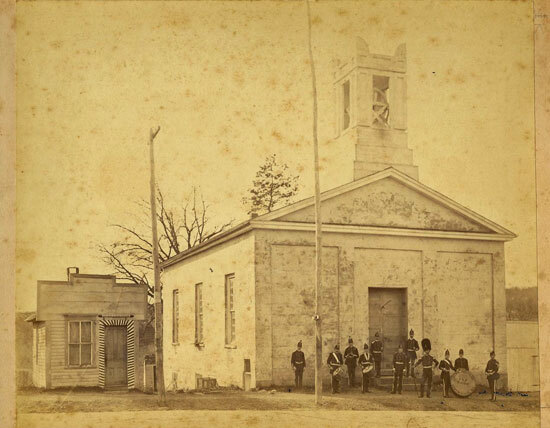 Over the next one hundred years, the boundaries of North Providence changed as parts of the town were reunited with Providence in 1767, 1873 and 1874. In addition, in 1874, a large part of eastern North Providence was annexed to Pawtucket. 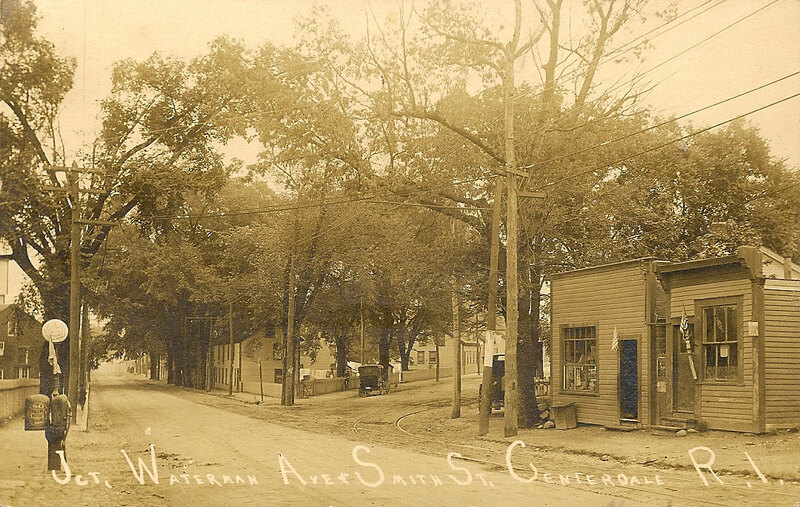 As a result, North Providence became the smallest town in the state with an area of 5.8 square miles and as a result the population dropped from 20,495 to 1,303 citizens. A hundred years later, the population again peaked at 20,000. Now in 2011, our population is 34,000. With the advent of the nineteenth century, the areas of the town near the Woonasquatucket River, the West River and the Wenscott Reservoir began to take on a more industrial appearance as mills were built. Except for the Fruit Hill area, all of the town’s villages changed after the beginning of the Industrial Revolution which ironically actually began in North Providence. Yet, when in 1790, the Slater Mill began operation, it was located on the west side of the river which put it in the North Providence village of Pawtucket. From 1765 until 1874, the Town of North Providence extended to the east as far as the Seekonk River and on the south to the vicinity of the State House which is now Providence. In the early 19th century, it became obvious that better roads were needed. Five turnpikes were constructed in North Providence with the cost of construction assumed by private companies. Turnpikes as distinguished from ordinary roads were those throughways with gates barring the progress of the traveler, at which payments were demanded for the privilege of using the road. The payments were called “tolls” and the gates were known as tollgates. Beginning in 1805, the Louisquisset Turnpike was constructed when a company of the same name was formed to improve the road. The tollgate for that road was at the Louisquisset (now Charles St.) and Mineral Spring pikes. In 1806 a turnpike was built passing what is now the Wenscott Reservoir (Twin Rivers) and it was called the Douglas Turnpike because the road extended to Douglas Massachusetts. Its tollgate was located just below Twin Rivers. In 1808, the Farnum Pike was started and finished in 1828. Eventually the road was named Waterman Ave. as a tribute to Caleb Waterman, a wheelwright and undertaker in Centredale during the 19th century. 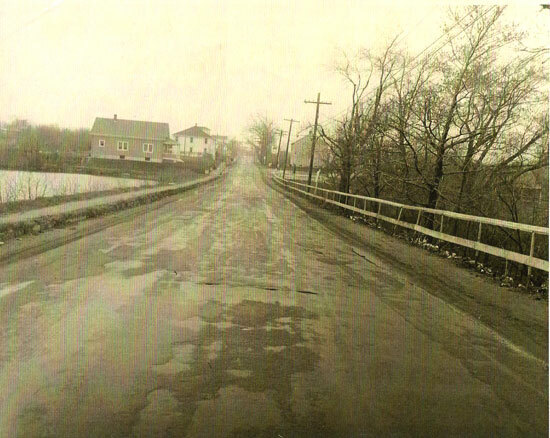 The Powdermill Turnpike (now Smith St-Rt.44) was named for the Revolutionary powder mill which was located on the Johnston side of the town line. Lastly, the Mineral Spring Turnpike was chartered in 1826 and named for a mineral spring in the village of Pawtucket. 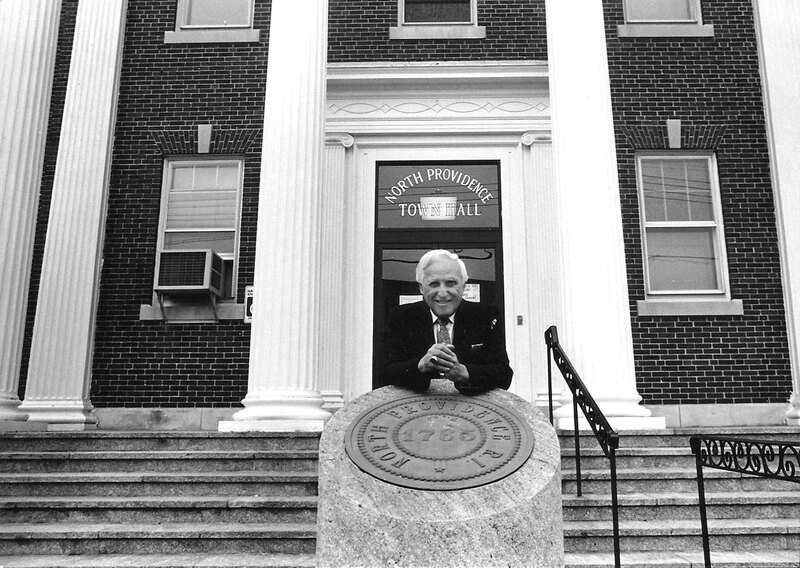 It gave town residents easy access to Pawtucket when town meetings were held there. Usually towns and villages in New England had a town pound to hold stray cattle or sheep as opposed to the dogs and cats of today. A descendent of an old North Providence family, Hezekiah Olney, had a town pound on his land c.1875 at the intersection of the Mineral Spring Pike and the Douglas Pike in the neighborhood of Woodville. For humans, confinement was in jails called ”Bridewells”. The name comes from a British name which was “a house of correction for the confinement of disorderly persons”. The name was derived from a palace built near Saint Bride’s or Bridget’s Well in London England which was turned into a workhouse. 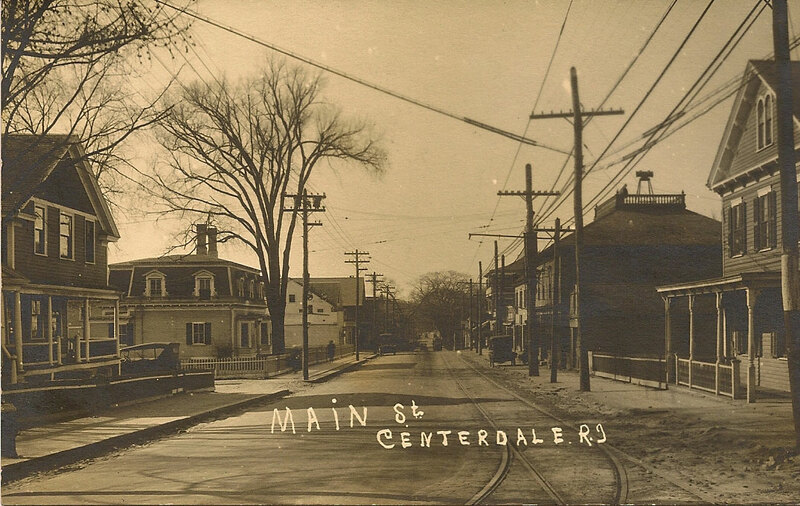 North Providence had Bridewells in Marieville, Woodville, Geneva and Centredale. The most bizarre location of such a confinement facility is recorded in 1888, when Lewis Woodward was directed to have two cells placed in the basement of the school at Marieville. 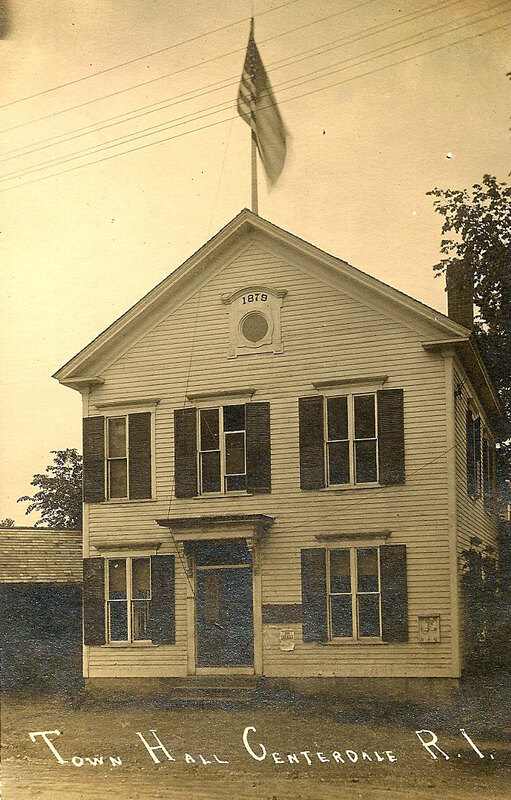 The first North Providence Town Hall built in 1879 on Mineral Spring Ave. When we think of a theater in North Providence, most older residents remember the Community Theater. 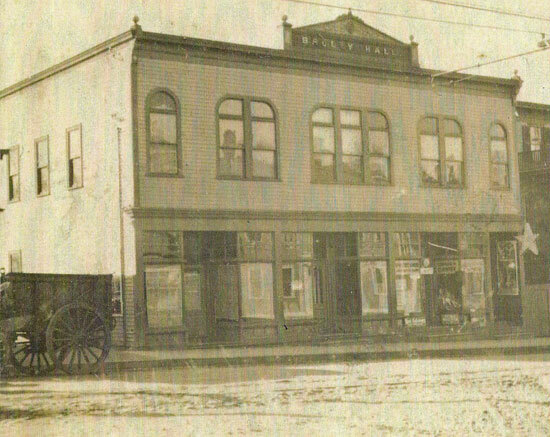 Actually, the first place of entertainment was located in the Armory Hall, where numerous plays were held from the 1860’s through 1892 when the hall burned down. Within the next 15 years, Clarence Broley built another building on the same site which had stores on the ground level and a theater called Casino Motion Pictures on the second floor. The building is still standing as a tuxedo business. 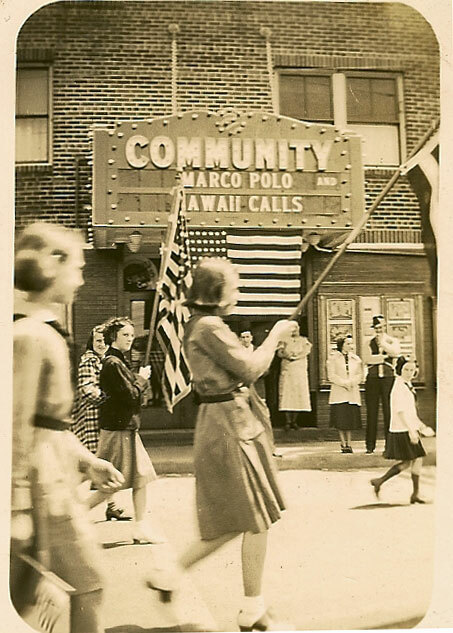 By the 1930’s, Napolean Trahan built a movie theater on Waterman Ave called the Community Theater. At the time the theater was destroyed in the 1970’s, it was named the “Hillside Theater”. North Providence had its art district which was centered in the village of Fruit Hill. At the turn of the 20th century, three well known Rhode Island artists took up residence in Fruit Hill. H. Cyrus Farnum resided at 95 Olney Ave. some of his most significant work was brilliant outdoor scenes of Africa and several portraits of Rhode Island governors. Mr. Farnum died at his home in 1925. On the other end of the same piece of land facing out on 1370 Smith St. was the home of George Whitaker who was known as the “Dean of Rhode Island Artists”. He had studios at the Providence Art Club of which he was one of the founding members. That house no longer stands but has been replaced by a brick apartment house. His style of painting embraced the Barbizon School. The third artist was Mabel Woodward who in 1931 was living with her family at 36 Belvidere Blvd. She is recognized for her oil paintings, especially coastal and beach scenes which today command high prices. She died in 1944. The first recreation area in North Providence called Peter Randall Reservation was a forested picnic center in which all sorts of scout groups pursued various activities. We would assume that someone named Peter Randall was an early resident of the acreage but in fact, he never lived there. In 1929, a 30 acre tract on Smithfield Road was donated to the State of Rhode Island to be used as a park in memory of Peter Randall, an eighteenth century resident of Providence. The land was originally owned by the Smith family and was sold to Edward Randall in 1824. It remained in the Randall family until the generous donation was made in 1929. North Providence from its inception until 1974, was the same as most towns in New England, namely being governed by a Town Council with Town Clerk and Town Treasurer. In 1974 this changed when we elected out first Mayor, Salvator Mancini.